(17910, Dorothy and Marcia Walters Collection, OHS). (19383.96.2, Frederick S. Barde Collection, OHS). (20560.9, Carl Sadler Collection, OHS). There is tremendous diversity in American Indian dance in Oklahoma due to the influx of tribes in the 1800s from various parts of the United States into what was then called "Indian Territory." When traditional ceremonies were suppressed in the late nineteenth and early twentieth centuries, many tribes turned to the emerging intertribal powwow to express their Native heritage through song and dance. Powwow singing styles are differentiated as being "Northern," originating in the central and northern Great Plains, Canada, and the Great Lakes regions and characterized by a high pitch and hard drum beat, and "Southern," synonymous with Oklahoma and characterized by a lower pitch and less strident drum beat. Competitive powwow dance styles associated with Northern drum groups are the men's northern traditional, grass dance, and northern fancy dance, and the women's northern buckskin, jingle dress, and fancy shawl. Southern drums are used for the men's southern straight dance and southern fancy dance, and for the women's southern cloth and southern buckskin. Social dances at powwows include the intertribal, round dance, and two-step. Numerous tribes in Oklahoma host annual powwows that include portrayals of both Northern and Southern styles. A typical drum group consists of ten to twelve men who drum and sing, with women singers, seated behind the men, joining in partway through the song at a higher pitch. Series of hard drumbeats, called honor beats, occur at specific places in the songs, honoring the drum and cueing the dancers. Dancers acknowledge the honor beats in different ways according to their style of dance. For example, the dignified southern cloth dancer bows her head at this time while the energetic jingle dress dancer raises her fan. 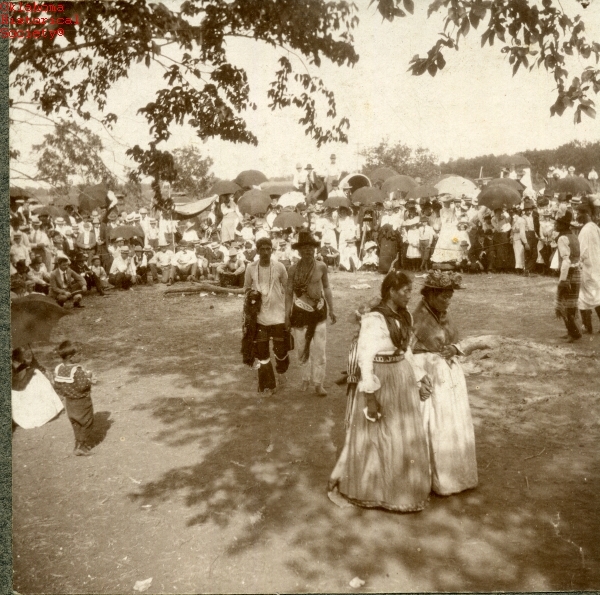 The gourd dance is now a familiar feature at powwows throughout Oklahoma. The Cheyenne, Comanche, Kiowa, and Ponca have unique interpretations concerning the introduction of this dance to their particular tribe. The musical accompaniment for gourd dance songs is a large drum, along with gourd or metal rattles shaken by the men dancers. Seated men drum and sing; women sit behind the drummers and join in partway through the song at a higher pitch. Gourd dance songs consist of two main parts, one with softer drum beats, during which the men dancers move around the arena, changing to another with loud, strongly accented drum beats, during which the men stand stationary while moving up and down to the rhythm of the drum. Women dance on the outskirts of the circle facing inwards, mirroring the steps of the men as they dance in place. A number of tribes brought their ceremonial music and dance with them during the forced removal westward in the 1800s. These include the Cherokee, Chickasaw, Choctaw, Creek, Delaware, Miami, Ottawa, Peoria, Seminole, Shawnee, and Yuchi, all of whom participate in the stomp dance. The singing is in call-and-response form, with a man as leader and chorus of men. On their lower legs the women wear shackles made of several small turtle shells tied together and filled with pebbles. Modern rattles are made of small tin cans instead of turtle shells. The men begin walking in a single file around the fire in a counterclockwise direction. Women take their places alternately between the men, and children follow. The shell shaker directly behind the leader sets the rhythm based on the leader's chant, and the rest of the shell shakers pick up and maintain the rhythm. Stomp-dance songs are sometimes accompanied by a small water drum at green corn, a Native ceremony of these eastern tribes that includes all-night stomp dancing. 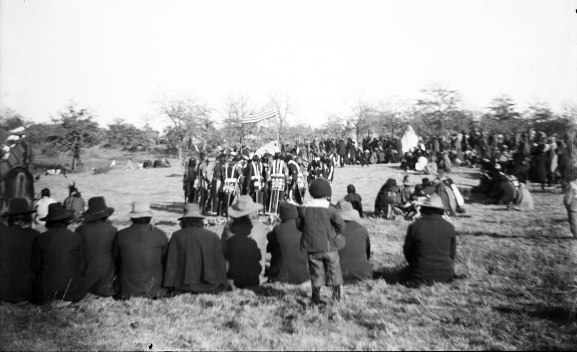 Throughout the plains the sun dance was a major event that brought members of the tribe together in an annual ceremony of prayer and renewal. The Cheyenne-Arapaho tribe near Concho, Oklahoma, continues to hold annual sun dances each June. Inside the specially constructed arbor, men dancers wear eagle-bone whistles around their necks. The whistles are blown in rhythm to sun dance songs, sung by both men and women, accompanied by a large drum. Women sun dance participants sit on the ground inside the arbor, praying on behalf of others. The sun dance lasts for four days, during which time participants have neither food nor water. Their dancers' extended families are an integral part of the ritual. The Fort Sill Apache hold their annual mountain spirit dance each fall at the tribal headquarters near Apache, Oklahoma. Wearing distinctive, elaborate headdresses, four men dancers personify powerful, spiritual beings that bring blessings among the Apache. Following these men are young men dancers who are in training for future ceremonies. Men who sing sit to one side of the dance area, accompanying themselves with water drums. After the men dancers have acknowledged the four directions, women dancers join in, moving slowly around the outskirts of the circle, taking small steps. The Black Leggings Tonkonga is an elite Kiowa warrior society that flourished during the nineteenth century and remains active. Their biannual ceremony is held near Anadarko, Oklahoma. The members' women relatives and members of the Tonkonga Women's Auxiliary, dressed in traditional clothing and using the men's lances and bonnets, perform scalp and victory dances to open the events. The men dancers, wearing black leggings and red capes to honor past warriors, then enter the arena and dance in time to songs that have been created especially for this society. Men singers accompany themselves with a large drum, with women singers seated behind the drum. Not all music accompanied dancing. The traditional function of the American Indian plains flute was as a private courtship ritual performed by young men. Comanche artist and flute player Doc Tate Nevaquaya was instrumental in the rejuvenation of traditional American Indian flute playing in the 1960s, and the art has continued into the twenty-first century. Oklahoma is home to sixty-seven tribal nations, thirty-nine of which have their headquarters in this state. Despite attempts to assimilate American Indians into the dominant culture, the tribes of Oklahoma continue to express pride in their Native heritage through traditional music and dance. Tara Browner, "Making and Singing Pow-wow Songs: Text, Form, and the Significance of Culture-based Analysis," Ethno-musicology 44 (Spring/Summer 2000). Bryan Burton, Moving Within the Circle: Contemporary Native American Music and Dance (Danbury, Conn.: World Music Press, 1993). Charlotte Heth, ed., Native American Dance: Ceremonies and Social Traditions (Washington, D.C.: National Museum of the American Indian, Smithsonian Institution, 1992). Jason Baird Jackson and Victoria Lindsay Levine, "Singing for Garfish: Music and Woodland Communities in Eastern Oklahoma," Ethno-musicology 46 (Spring/Summer 2002). Ellen Koskoff, ed., The Garland Encyclopedia of World Music, Vol. 3: The United States and Canada, Part 3, Section 1: Music of the American Indians/First Nations in the United States and Canada (New York: Garland Publishing, Inc., 2001). Luke E. Lassiter, The Power of Kiowa Song: A Collabortive Ethnography (Tucson: The University of Arizona Press, 1998). Lotsee Patterson, "Comanche," in Native America in the Twentieth Century: An Encyclopedia, ed. Mary B. Davis (New York: Garland Publishing, Inc., 1994). 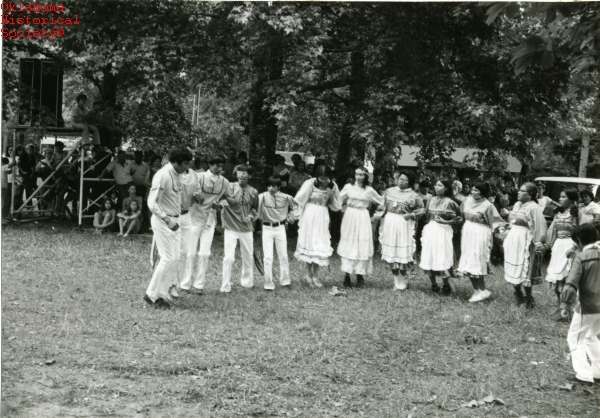 Paula Conlon, "Dance, American Indian," The Encyclopedia of Oklahoma History and Culture, https://www.okhistory.org/publications/enc/entry.php?entry=DA008.